Another bearer of the Smallman crest was John B. – a brother of the T.H. Smallman who had purchased "Waverley" in 1892. While T.H. Smallman was associated with the London and Port Stanley Railway, the Canada Chemical Company and other interests, his brother, J.B., was of the Smallman and Ingram firm – now Simpson's Ltd.
From 1858 to the 1890's the property was occupied by Wm. Glass, after which the present house was built and lived in by John B. Smallman until 1916, and then his sister until the house was sold in 1955 to the Shriner's Order. 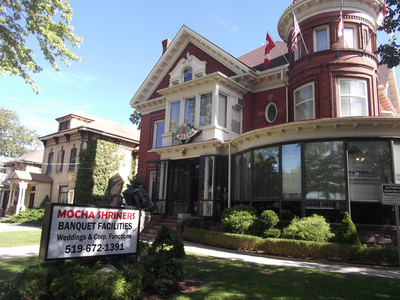 It now is known as the Mocha Shrine Centre. This Edwardian home is of monumental size, but nevertheless its design is true to the Edwardian predilection for gables, towers, the generous use of large windows (how light and bright they are! ), a steep and irregular roof line, careful chimney design and construction, texture in glass, stone, wood and brick, a lavish use of classical, floral and stylized ornamentation. The foundation of red sandstone is pierced with basement openings elegantly barricaded with decorative iron gratings. The infill in the gables if richly textured and blends well in tone with the red brick – as does also the skillfully laid tile of the tower. In gables and tower there is a wide overhang with brackects in the former, and dentils in the latter. Each gable has interesting window treatment; the Palladian window variation in the front gable is of particularly rich design with its deep and sweeping curved heading. Notice the bordering of the windows with egg and dart moulding. Upon entering the verandah – likely glassed in at a later date – the magnitude of the door, its deep set back within its ornamented framing arch, the bevelled and textured leaded glass of the door, sidelights and transom, the framing Ionic column, form a powerfully effective architectural compution, and is indeed prophetic of the richness of design and superb craftmanship that is to follow. Minute details, such as the egg and dart border of knobs and door-plates, are heady diversions that bespeak another time and way of life, with the additional message of preservation and protection of what cannot be easily replaced – echoes of Edwardian grace and a secure and oak paneling is in the ceiling and on the walls of the vestibule and hall. Directly in line with the door, at the end of the hall, is a Family crest set in coloured glass. That the motto of the coat of Arms is in English is of interest. The entrance to the left is into a large, cherry-trimmed room with a fine laster ceiling with the popular oval shape brought into use; this way very likely the drawing room; notice the lighting fixtures – once gas, now wired. The fireplace is framed by columns and a deep cornice, and tile, very popular in the period, borders the fire box and is used in the hearthstone. The egg and dart pattern appears again. The room to the right with the inclusion of the tower – delightfully furnished with a circular window seat – was the library as is evident from book cupboards with leaded glass doors; pilasters between the cupboards are ornamented with bas-relief carving. Here again the door hardware – smaller in proportion – has the now familiar egg and dart accent. The fireplace is of particular interest with its three, beautiful niches – provocative as to artifice. Panelling on walls and ceiling are of especial appreciation of us to-day – we who find wood to be not so plentiful a material as once it was – nor will it be in spite of our Government's generous planting programme. A heritage of great value indeed! Here and elsewhere in the house the quality of the craftmanship will be a joy to behold and linger over – a reminder of what at times seems to be increasingly rare in today's hurried building. To the rear of the hall an entrance opens into a large room – once the dining room. The even larger, well-lighted, room at the rear of the dining room was the billiard room; seemingly, a steel beam has replaced a wall that may once has separated the two rooms. The oak fireplaces surrounds, and the ceiling in the first room are of oak. In the usptairs hall is a long sideboard, of the same material on time, that likely was in the dining. A splendid landing, two steps up, is at the rear of the entrance hall. At the second landing is a rounded bay window, with coloured and painted glass; some textured glass and "jewels" have been included in the design. A tour of the upstairs is of interest because of the variety in the fireplaces, the size of the rooms, and examples of bathrooms as they were at the turn of the century. This mansion, although no longer residential, functions in a useful way in providing meeting facilities of a beneficent organization that contributes much richness of life not only to its members but also to the community – particularly to children. The addition, in recent years, of the banquest facilities at the rear of the original building allows the catering of large gatherings not only of members functions but as a fund raising source from non-members banquets and social events.